You can always count on the fashion "aristocracy of talent" (Fran Lebowitz) to be as harsh and honest about a fashion show as they have to be no matter who is showing on the runway. Kanye West has become very well known in the industry as a front row commodity and lover of the art, maybe not by Vivienne Westwood and has not convinced the fashion elite yet with this show. For years now rumors have been floating around that Kanye will be debuting a clothing line called PastTelle, which no one thought was a surprise that an artist that has always cared about his wardrobe would take on such a venture. 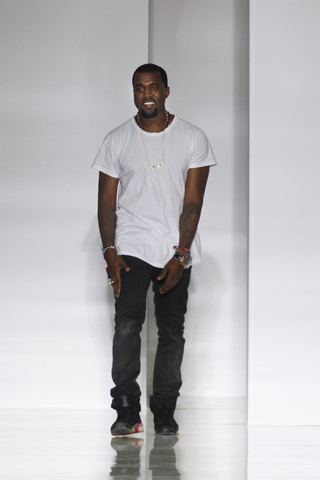 Kanye has evolved along with his music and has decided to take on the runway instead of street wear blogs with his first show for Spring 2012 Paris fashion week. All reviews have unanimously agreed that Kanye's show was too heavy, over styled, under styled, and ill fitting, but do praise his efforts and obvious passion and encourage him to try again. As I always say Kanye can do no wrong in my eyes but this time on the runway I would replace certain details and tighten up certain silhouettes but what do I know really this guy is sitting front row while I am on NYTF zooming in on pics. Color blocked pants pretty dope. Zippers and fit? I wouldn't let her in the club. Look at the Man's face u can see the hard work written all over it. Hip Hop, models and fashion is incredible how they got all together in one to make this culture a trend and stay with us!!!! VIDEO: RIHANNA "WE FOUND LOVE"